From the Fejervary-Mayer Codex, City Museum, Liverpool. Mixtec. XIUHETCUTLI, THE FIRE GOD, AT THE NAVEL OF THE EARTH From him grow the four world directional trees. East is on the top of the picture, the place of the rising sun from whence arose QUETZALCOATL. Here ITZLI, the god of sharp stone, faces the god of the rising sun. 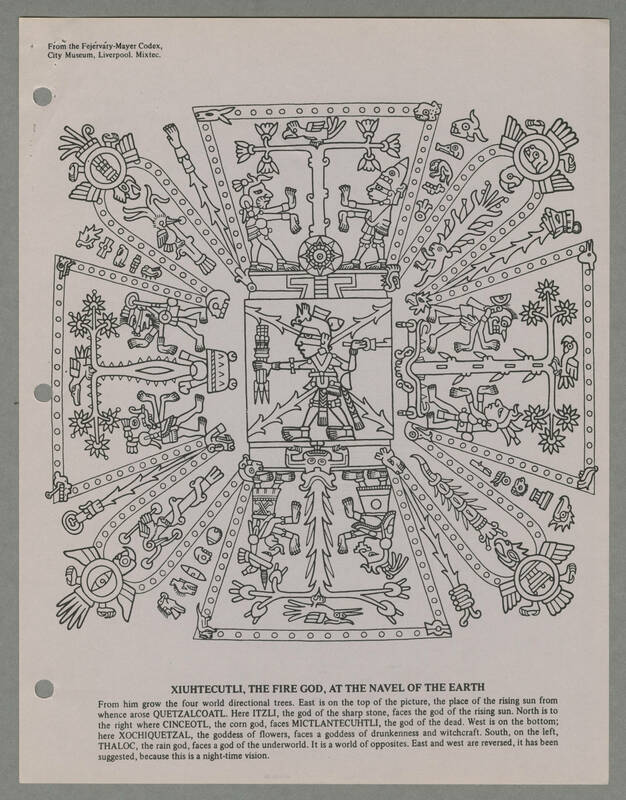 North is to the right where CINCEOTL, the corn god, faces MICTLANTECUHTLI, the god of the dead. West is on the bottom; here XOCHIQUETZAL, the goddess of flowers, faces a goddess of drunkenness and witchcraft. South, on the left, THALOC, the rain god, faces a god of the underworld. It is a world of opposites. East and west are reversed, it has been suggested, because this is a night-time vision.